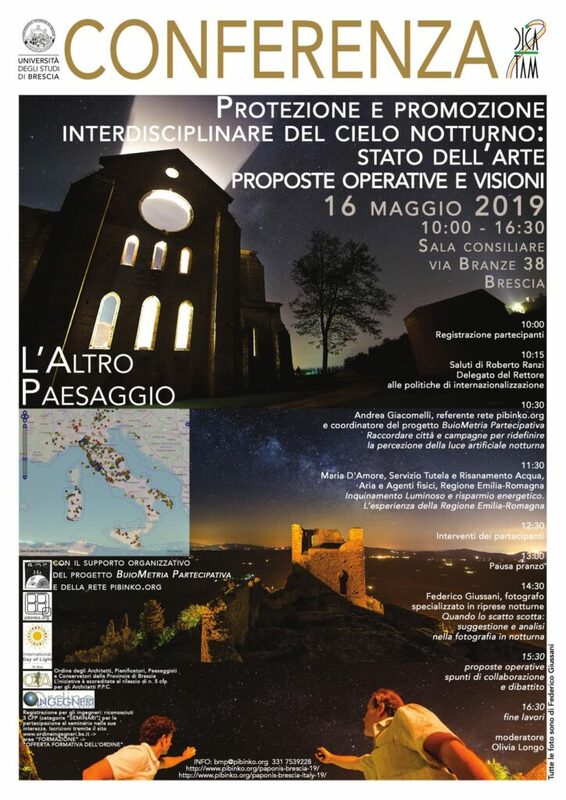 On May 16, 2019 in Brescia, Italy, there will be a conference concerning the interdisciplinary protection and promotion of night sky, elaborating on state of the art, action items, and visions. The event is managed by the Department of Civil, Environmental, Architectural Engineering and Mathematics from the University of Brescia, the BuioMetria Partecipativa project -active since 2008 on the topics of the conference- and the pibinko.org network. This is composed by professionals with multiple years of international activity, and with a peculiar combination of expertise, intertwining culture, environment, open innovation, and arts. The conference falls in the line of a recent series of initiatives developed in the context of a collaboration of the BMP project with the Italian Research Council’s Institute of Biometeorology and the Department of Biology at the University of Pisa, including an international symposium on the Island of Capraia in September 2018 and a national workshop in Florence in March 2019. The conference will take place during the International Light Day celebrated by UNESCO, and has been accepted by the Charter of Architects and the Charter of Engineers in Brescia as valid for the issue of training credits. 10.30 AM – Andrea Giacomelli, pibinko.org network and BuioMetria Partecipativa coordinator: Connecting cities and rural areas to redefine the perception of light at night. 11.30 AM – Maria d’Amore, Light pollution and energy saving. The experience by Regione Emilia-Romagna. The conference will be chaired by Olivia Long from the University of Brescia. In addition to the program presented in the flyer, from 6PM to 8PM we are considering an outreach event (venue to be confirmed). Experiences in the creation of value in from night skies (star parks, astro-tourism and other activities at night). • Sharing of operational proposals for 2019-2020, including the possibility of triggering collaborations with the participants.